Today I drove Bertha the Buick to the Peace Arch crossing in Blaine. Fortunately, the queue for Canadian immigration and customs was short and sweet. A passport is not yet required for a land into Canada for US into Canadian citizens, but one is required for your return to the States. You will need a government issued picture ID and some proof of citizenship to enter Canada. Rules may change, so check before you go with the Canadian Border Service Agency and US Customs and Border Protection. The total drive time from Bellingham to Vancouver Airport's South Terminal was only one hour including my border crossing, but I always give myself two "just in case." I left Bertha parked in the airport lot. The cost is $11.00 a day and the time can be extended if needed over the telephone. That's nice to know in case plans change or the weather becomes a factor. At the South Terminal, I catch a Pacific Coastal Airlines flight that goes direct to my hometown, Powell River. Pacific Coastal also has connections to many Vancouver Island and BC destinations. For me, it is only a 25 minute flight up the Sunshine Coast. To make flying more affordable, check out their new Quick Pass system. If you are lucky, you just might get a ride on the Shorts 360. It's a unique plane that looks like a flying boxcar to me. The one-way cost is about $150.00. The Quik Pass includes discount fares for frequent fliers. Transportation is easy in Powell River. Your Pacific Coastal flight crew can call ahead for a Powell River Taxi to be waiting to whisk you away to your first adventure. If you are on the ground, you can call them at (604) 483-3666. You might be lucky enough to get one of our good friend John's brothers, Rick or Rob. They both have new Prius cars to be environmentally friendly and economical. If you want a car, Budget car rental is in the terminal. There is also a stop for the Powell River Regional Transit District bus outside. This bus can take you all around town or, with a co nnection, to the community of Lund at the end (or beginning depending on your point of view) of Highway 101. But since I am "goin' home," Wayne will pick me up in the truck and we'll head strait to the cabin. See you later with some great winter tales from "up the lake." 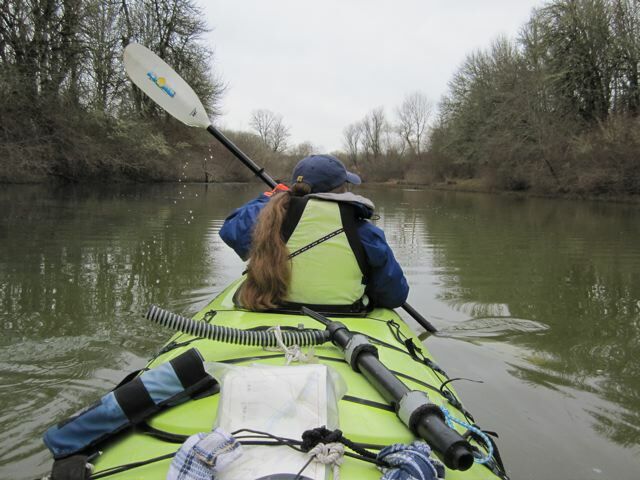 Last weekend we lucked out with good weather for our winter kayak trip on the Willamette River in Oregon. The trees looked bare, but up close you could see all the buds just ready to pop. Last week I was surprised by Lorac over at Ahhh...The Cottage Life. I was honoured that she gave me the Stylish Blogger Award. Lorac is a fellow Canadian who hails from Georgetown, Ontario. I always enjoy her posts about nature and scenic countryside. Thanks Lorac. And now for the rules of the award"
“By accepting this award I’m to tell five of my favourite things and then pick five people to pass the award on to." Number one has to be our cabin up the lake. Of course, it is much more than just a structure. It is a way of life I've always dreamed about. Ever since my childhood my grandmother said I was born in the wrong generation. I love getting away from civilization, living off the grid and learning self sustaining skills that I never needed in my former city life. Gardening. I've always enjoyed growing things to eat. Even when we lived in city condos, I had a little patch out back. My floating garden has been lots of fun. 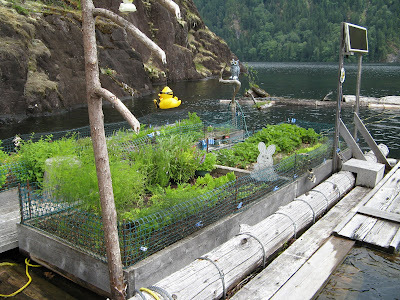 It is four raised beds on a cedar log float. Plus I do lots of container gardening on the cabin deck. Watercraft. Until we got our cabin, I hardly ever went boating. Now we have lots of boats and I'm learning how to drive some. 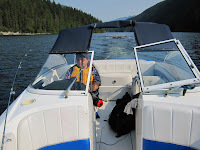 My favourite is our Campion bow rider lake boat which is easy for me to manage. Wayne drives most of our other boats including a Bayliner for ocean trips. We also have several kayaks and a new (to Wayne) Laser sailboat. Cooking. I enjoy cooking especially when we are at the cabin. I have a propane stove but have experimented with lots of recipes using our wood stove. In winter, it is going almost 24/7 and the heat is free. I've even used it as an oven to bake bread. Nature. Whether I am in the city or country, I love to look for the beauty in nature. I love bird watching and identification. Of course, that is easier up the lake, but there are always birds every where you go. Using our quads (ATVs) Wayne and I have seen some beautiful country that would be inaccessible otherwise. 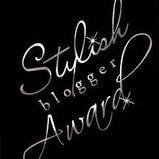 Now I have to pick five blogs that I follow to pass the Stylish Blogger Award along to. Like Lorac said, that's hard to do, but here goes. Float Cabin Construction. This is a new blog, but the animated video of float cabin construction is well worth the visit. Jeddy lives in Powell River and is a good friend and great support of Powell River Books. KnowBC. This is a great site for past and current information about British Columbia. It's authors are BC author Dan Francis and Howard White of Harbour Publishing. Solar Burrito Blog. 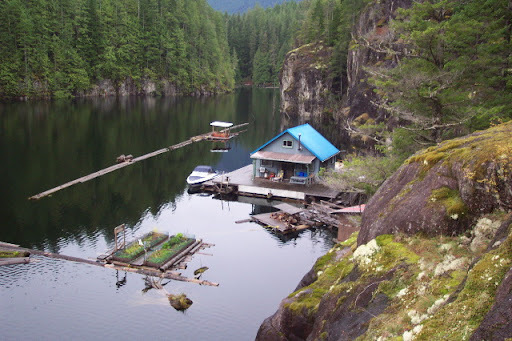 Solar Burrito writes about cabins and living off the grid. There's always something interesting to learn if you like the remote lifestyle. Thistle Garden. I've written about Margaret from Powell River before, but her blog is one of my absolute favourites. She writes frequently about gardening and is a role model for me. 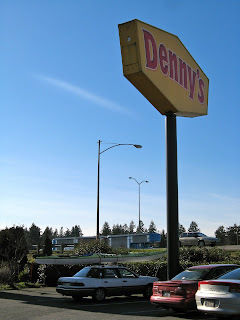 Bellingham Daily Photo. lizziviggi and ejvig team up to share the town of Bellingham through a photo a day. I've learned a lot about my second home through them. One of the enjoyable parts of our kayak trip on the Willamette River was bird watching. Even on a cool February day we had quite a few sightings. But birds can be quick to take flight, but I did get a few interesting shots. On departure, we had our send off from a small flock of Mallard Ducks, and all along the water trail we saw pairs and small groups enjoying their day on the water. They had a knack for catching the fastest part of the current to scoot downstream with no effort. We found Canada Geese in pairs or small groups walking the gravel bars at the river's edge. We also saw huge flocks flying in V-formation overhead heading home to spend their spring and summer north of the border. A wonderful surprise was seeing so many Great Blue Herons. One majestic bird stood his ground (snag) as we passed. Then an even bigger surprise, we discovered two Heron nesting sites in tall trees. The bare limbs allowed us to see multiple nests in close proximity to each other. As we quietly paddled up the narrow bay near Albany, we saw a Grebe diving for fish or other underwater treats. We also saw several Kingfishers flying back and forth across the bay, loudly announcing their presence. But both were too quick for camera extraction. 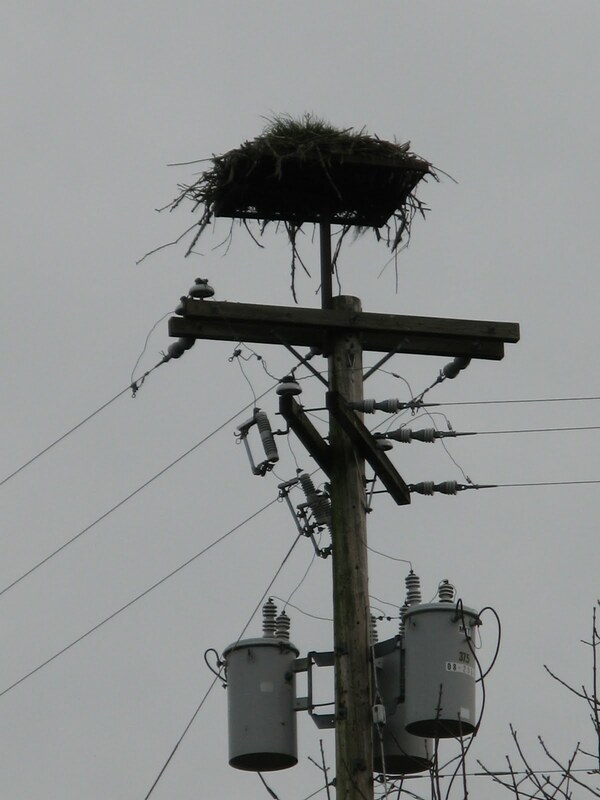 We didn't see any Osprey, but saw several of the nesting platforms provided by the electric company on power poles. Yes, they are doing a service for the osprey, but they are also helping themselves by preventing nest construction near wires causing service disruption. 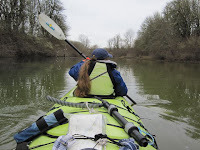 Our winter kayak trip on the Willamette River started in downtown Corvallis, Oregon. After our launch (see yesterday's post), the river moved at a respectable 3 mph. That meant we didn't have to paddle too hard. As we passed a bit of graffiti we were reminded we were in Oregon State University territory. I can imagine college students enjoying this river in an inner tube during warm summer months. The river is wide and deep, with very few snags and no sweepers on this leg. Even though it passes through private farmland, the banks are lined with trees and gravel bars most of the way. In addition, there are lots of designated landings and park land along the way. It's a true natural treasure. A lot of the credit goes to an organization called Willamette Riverkeeper. It took us about three and a half hours to get to Albany. Along the way we saw lots of great spots for primitive camping on gravel bars and grassy knolls. We want to return to give it a try. Just before Albany we found a narrow backwater bay. The flow was minimal, the shallows were filled with water plants and Kingfishers zoomed back and forth loudly announcing their presence. 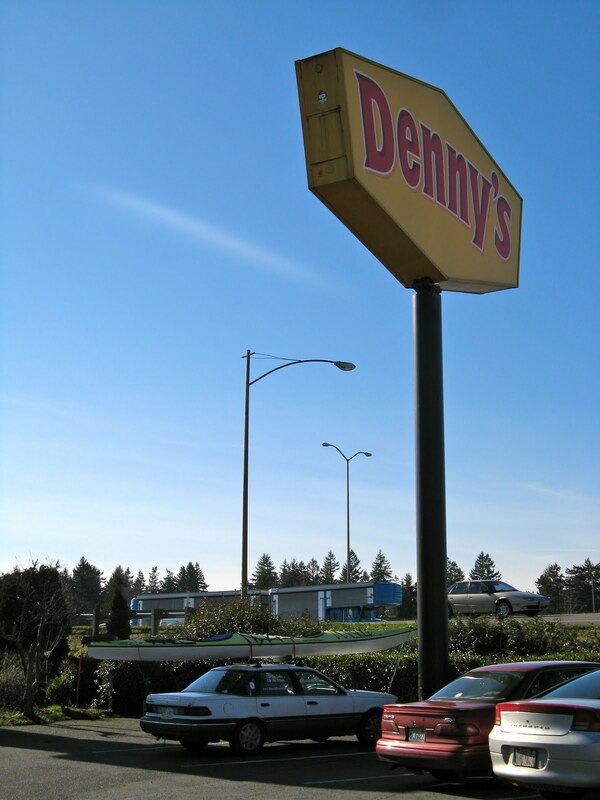 Wayne and I strapped our "Big Yellow Banana" on top of the Tempo for a drive down to Corvallis, Oregon. Our destination had two purposes. The first was to catch a (winning) USC women's basketball game at Oregon State. The second was to paddle the nearby Willamette River. The next morning our first stop was Peak Sports. It's a huge store located in vintage buildings over two blocks in downtown Corvallis. We got some excellent free paddling advice from store personnel. We also purchased a Willamette Water Trail Guide. It comes in two volumes depending on which part of the river you plan to explore. 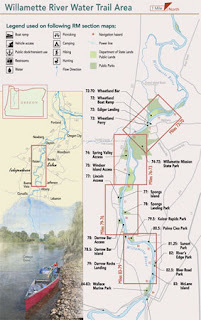 The guide is available to print for free online if you like to plan ahead at the Willamette Riverkeeper. This organization was "founded in 1996 and are dedicated to the protection and restoration of the Willamette River. " Based on the recommendation we got at Peak Sports, we chose the Water Trail segment from Corvallis north to Albany. It is listed as "Easy" and can be paddled in all seasons. We took the Tempo right to the river's edge at Michael's Landing. The cement boat ramp is a bit worn, but gentle gravel slope is perfect for kayak launching. It was very quiet on a partly cloudy February day, but we did have a cheering squad to send us off in true river style. Stay tuned. Tomorrow I will take you along with us down the river. Today is the third anniversary of our landing in Canada as permanent residents. Wayne and I celebrated with a nice dinner out with a Pale Ale toast. We decided in 2006 that we wanted to move to Canada to live full time, and with the help of an immigration lawyer, that became a reality on February 11, 2008. Yes it took almost two years, but it was well worth the wait. Here is a cute video that tells you why everyone wants to be Canadian.